On this page ► Undiscovered villages of France The "Plus beaux villages"
Over 150 villages and small towns in France proudly promote themselves as one of the "most beautiful villages in France"; but this is just the tip of the iceberg, a label that villages can apply for ... at a price. There are, on the other hand, litterally thousands of beautiful villages in France, and they can be found in all regions; but for many smaller villages, the cost and hassle involved in getting labeled as a "Plus beauvillage de France" is too great. So while the same 150 officially beautiful villages get listed in all the brochures, there are plenty more very beautiful villages in France that rarely get a mention except by local tourist offices with local knowledge. 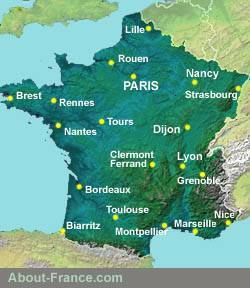 Click for best online rates for hotels near the following towns on the main routes through France. Besides, since almost every regional tourist brochure and website, and many others too, vaunt the charms of the same villages with the "Plus beaux villages de France" label, these villages tend to attract hordes of visitors at weekends and in holiday periods, and can become patent illustrations of the often-ignored maxim that "Tourism is like seasoning on food. Some can make an improvement, a little more can make it perfect. A lot ruins it ....."
There is no official list of the most beautiful undiscovered villages in France; that would be a contradiction in terms. By definition, there is no such thing as an "undiscovered village"... But About-France.com presents a growing - but very incomplete - list of some of the most beautiful unspoilt villages in France, that have not been overrun by tourists. These villages do not have any official "most beautiful village in France" label; but they are beautiful traditional villages, with plenty of character. Maybe they can't afford the official label; maybe they just don't get enough tourists to make it worthwhile.... In some cases they are just off the beaten track, and rather inaccessible to tour buses. But whatever the reason, the traditional French villages and small towns listed below are all worth a visit, and all have something, in addition to their character, to make them worth visiting. Compared to the tourist hotspots of the most popular "plus beaux villages de France", these villages are relatively deserted. Just the village, and a few tourists looking - like you perhaps - for authentic French villages off the tourist trail. How big is a village? This list is different from the usual lists of best villages. None of the following are classed as "most beautiful villages in France" - though all of them are as fine as, and often more attractive and more authentic, than some of those that are. Villeneuve sur Lot The former royal bastide town is perched on a hilltop overlooking the valley of the Boudouyssou. The almost perfectly preserved bourg is surrounded by its ramparts; it has a small central square, and an interesting belfry with a lunar clock. near Auxerre Fine medieval fortress village, on a hilltop overlooking the Burgundy canal. Close to A6 motorway. near Tournus Small "medieval" hilltop village in south Burgundy, with castle and romanesque church with frescoes. The village is classed as a historic monument. near Concarneau The artists' village. In the second half of the 19th century artists flocked to Pont Aven. They included Gauguin, 14 of whose works can be seen in the town's Art Gallery, which tells the story of artists in Pont Aven. Quayside. near Lorient Little island village in the tidal estuary of the ria Etel, linked to mainland by stone bridge. 12th century chapel. near Salins les Bains A small village close to the source of the river Lison - a vauclusian resurgence - and the "Taillanderie", a historic working scythe-making museum. Attractive hill country all round. Northwest of Montpellier A very pretty small village located in the dry "garrigue" landscape of inland Languedoc, in the valley of the Buège. Castle. Near Guéret Small village in the verdant Creuse valley, with an ancient Benedictine abbey, and "Roman" bridge across the Creuse. Deepest countryside all round. near Pamiers One of the hilltop villages of the Pyrenean foothills. Still partly surrounded by walls, this village is an artists' colony. Lots of galleries and workshops open July and August, less in other months - but a delightful village at any time of year. near Rodez Very attractive village clinging to the steep scarp of a narrow valley. Spectacular waterfall, museum of rural life, romanesque church, vineyards close by. near Millau In a valley on the Larzac, a short distance from the A75 motorway, Sainte Eulalie is a small fortified village once a bastion of the Knights Templar. Medieval fortifications, narrow streets, less visited than the nearby La Couvertoirade. near Figeac Less well-known than the nearby very touristy village of Saint Cirq Lapopie, Capdenac - smaller than Saint Cirq - built on the top of a rocky buttress, and enclosed by cliffs and ancient ramparts, parts of which are Roman. The village has a few small shops, lovely views from the ramparts, a medieval keep and a medieval garden. near Manosque A beautiful old "perched village", in the Monts de Vaucluse. The village is dominated by its massive round medieval castle. Its narrow streets and houses cling to the hillside below the castle, above a valley with lavender fields. Vaucluse Saignon, near Apt Perched on ridge at the edge of the Luberon, this delightful village has wonderful views all around. At one end of the village stands a medieval pilgrimage church, at the other, on a rocky outcrop. the remains of a castle. the two are linked by a narrow main street and a small shaded square with a historic fountain. near Aubenas Historic village amidst the vineyards and olive trees of the Ardèche, south of Aubenas. Romanesque church, plenty of character. near Nyons A very picturesque and unspoilt village perched on a rock in the gorge of the river Eygues. The small village church has been recently renovated. From the village a 2 km walk takes you to the remains of the historic Abbaye de Baudon. From vantage points, admire the valley and the massive griffon vultures that live on the surrounding crags. Let's be quite honest; villages and small towns that obtain the "Plus beaux villages de France" label are generally very attractive places. Which is why some of them get lots of tourists - far too many of them. Villages like Beynac, Saint Cirq Lapopie, Cordes sur Ciel, Conques, Montflanquin, Pérouges, Rocamadour, Riquewihr, Talmont sur Gironde, and most of the most popular "most beautiful villages in France" are definitely places to avoid in peak tourist periods, unless you really want to see them and have no other time to do so. If this is the case, make sure to choose a weekday, not a weekend. That being said, overcrowding is a problem that essentially concerns the most popular plus beaux villages, those that are firmly on the tourist circuit. Many other "plus beaux villages" are less affected, as they are less well-known, or more off the beaten track. Examples that come to mind are Najac, on a rocky spur overlooking the gorges of the Aveyron (one of 10 plus beaux villages in the Aveyron), Sainte Suzanne in the Mayenne, or Blesle in the Auvergne. But for the beautiful villages that are mentioned on all the tourist websites and in all the brochures, visiting at peak tourist perionds and busy weekends is not recommended. About-France.com has a series of pictures of the village and church at Conques, with hardly anyone about. But these pictures were taken in February. Where pretty French villages are concerned, there is definitely something to be said for seriously off-peak tourism – though on the downside (yet in some ways, for a more authentic experience), many of the cafés, craft shops, inns and small galleries that populate the most popular villages in France are closed out of season. Official list of "most beautiful villages"
Click here to see the map of officially registered Plus beaux villages de France. For more ideas on places to visit in each region, check out the tourist attractions section on each of the regional pages in the guide to the regions of France. In the end, it is up to you, the traveller, to decide for yourself what are the best places in France. Website, text and images copyright © About-France.com 2003 - 2019, unless otherwise indicated. Simiane la Rotonde : by Véronique Pagnier creative commons licence.